COLUMNA MESSIANIC RESEARCH CENTER: WHO CAN REALLY SOLVE CLIMATE CHANGE DISASTERS? We Heard A Lot About Climate Change From Men; and People, Cities, And Nations Are Destroyed! It's Time To Listen To GOD And Know The Root-Causes & Solutions To Disasters! WHO CAN REALLY SOLVE CLIMATE CHANGE DISASTERS? We Heard A Lot About Climate Change From Men; and People, Cities, And Nations Are Destroyed! It's Time To Listen To GOD And Know The Root-Causes & Solutions To Disasters! There are lots of websites and articles in the Internet discussing and explaining the problems and solutions to the dreaded Climate Change in the perspective of scientific/technological, industrial/commercial, political/legal, and economics/financial aspects. But, all the proposed human solutions are bound to failure, if the real cause or causes of Climate Change are not given attention, which are spiritual/biblical. In another extreme, several people, even religious people and Christians that claim to follow Christ, are skeptics and deniers about the truth of Climate Change/Global Warming. They say that Climate Change/Global Warming is a HOAX! Yet, another group of people believe that these Climate Change disasters are caused by CLIMATE WEAPONS, such as, HAARP, Weather Weapons, or TESLA Technologies. Observed that with all these discussions, Mankind is not mentioning God in the Climate Change equation. Yet, the undeniable Truth is that God is the CREATOR AND CONTROLLER of Climate Change, which means that God alone really understand Climate Change. And God alone can provide the real and lasting Climate Change solutions! BETTER LISTEN TO A "PROPHET OF DOOM" AND STAY ALIVE, RATHER THAN IGNORE IT, AND END UP DEAD! So, listening to the mixture of truth and falsehood of men will just confuse you, and will make you unprepared for the increasing ferocity and frequency of Climate Change disasters. We better listen now to the Great Almighty GOD -- the Creator and Controller of Climate Change! American meteorologist Dr. Jeff Masters said, "tropical storm "SENDONG" (international name WASHI) is one of the world's deadliest storm. Since the storm hit in the middle of the night, and affected AN UNPREPARED POPULATION THAT HAD NO FLOOD WARNING SYSTEM in place, the death toll was tragically high." The genuine BRIDE OF CHRIST postings, writings, teachings, and preachings are all WARNING SYSTEMS for the more disastrous and tragic events that are sure to come, as prophesied in the Bible. We may sound like a Prophet of Doom; but it is better to listen to a "Prophet of Doom" and stay alive, rather than ignore it, and end up dead! DON'T EVER FORGET GOD WHO CREATED THE WISDOM OF SCIENCE AND TECHNOLOGY! OTHERWISE, YOU WILL ALL PERISH! So, now, we can see the problems of the scientific, engineering, and business management community. They have forgotten that the real source of their wealth, success, and creativity is no other than GOD Himself. If they will not remember this vital truth, then they, their business enterprises, and their nations will be destroyed! As men used and are using God's physical Science & Technologies, and are ungrateful, God will use the same Science & Technologies of Nature, to awaken them. Thus, we have Climate Change disasters (heavy rains, flashfloods, supertyphoons, hurricanes, tornadoes, extreme cold and heat, drought, etc. ), Earthquakes, Tsunamis, Volcanic Eruptions. FOR US TO SURVIVE, WE MUST CONSULT THE OEM OF THE EARTH AND THE UNIVERSE! The BEST thing that we should do now is to listen to the MANUFACTURER AND CONTROLLER OF CLIMATE CHANGE -- THE CREATOR GOD HIMSELF! God created the Earth, the Heavens, and all the spiritual and scientific laws in them. 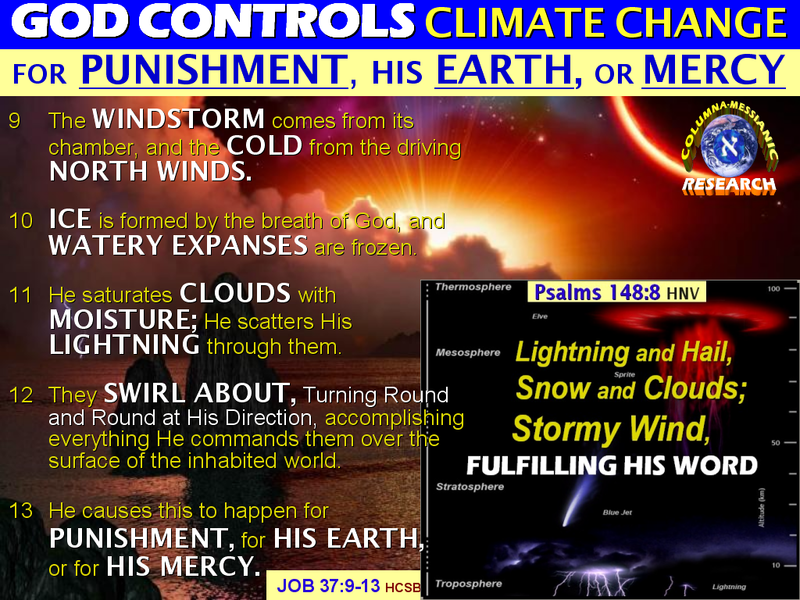 These Laws of the Heavens and the Earth manipulate Climate Change according to God's Purposes. Engineers knew that when their machinery have problems, they have to consult the OEM (Original Equipment Manufacturer) to really solve the problems. With regard to Climate Change problems, we have to do the same -- consult the OEM of the Earth and the Universe! So, this unique website will show you God's statements and explanations about CLIMATE CHANGE -- its CAUSES, EFFECTS, PURPOSES, and SOLUTIONS! This is the only website in the Internet that gives you the WHOLE TRUTH about Climate Change, from the GREAT GOD -- the Creator and Controller of Climate Change! WHY CLIMATE CHANGE DISASTERS? Let's Listen to God For Answers! JESUS CHRIST CONFIRMED CLIMATE CHANGE IS REAL, NOT A HOAX! People Know How to Interpret Climate Change Scientifically, But They Don’t Know Its Spiritual Meaning. And They Don't Know How to Judge the TIME They Are Living Now! WHY? The UNTOLD TRUTH of CLIMATE CHANGE: The Revolving Flames of the Two-Edged Sword! GLOBAL DIMMING: A New Kind of Climate Change! UNITED NATIONS CLIMATE CHANGE CONFERENCE: A Repeat of the Tower of Babel Scenario! Cause 5: TAKING GOD'S NAME IN VAIN! Don't say, "God Bless!" Cause 6: The SUPER SINS OF PEOPLE & NATIONS Are The Causes of Super Typhoons, Tornadoes, Earthquakes, etc. All Human Attempts to Help the Survivors Are Just "Filthy Garments" to God! To Avoid the Next Super Typhoons & Super Earthquakes We Must Replace Our "Polluted Garment" with the Fine Linen Made of Christ's Light! Effect 3: Global Warming and Extreme Heat! Effect 4: God Ignites Wildfires! Effect 5: People and Countries Become Fuel to the Fire! Effect 6: Global Dimming and Darkness! Effect 7: God send Wild Beasts and Snakes To Attack People! Purpose 3: Man To Tremble Before God, To Know HIM as The LORD, and To Return To HIM! Purpose 4: To Listen to GOD and Live! Purpose 5: To Seek the True God, NOT Idols! Andrea Bunting Why don't women get a mention in this? We are at fault too, you know. Columna Energy @EnergyAndrea Bunting, women are part of men; so, when men are mentioned, you, and other women are included. That's why you are called WO-MEN; the word MEN is there, because women just came out, or made from Men (Genesis 2:23). Andrea Bunting Don't be silly. Women are not part of men. I suggest you avoid sexist language in the future especially in forums like this. Columna Energy @Andrea Bunting, your "out-of-nowhere" reasoning is a major cause of Climate Change disasters. Andrea Bunting No it's not my reasoning but my wasteful practices that contribute climate change. But have you read the university's policies on non discriminatory language? Would you like me to send you a link? Columna Energy The root of your wasteful practices is your false human reasoning. You know nothing yet, as you ought to know. This is because you keep on believing and trusting the man-made and man-taught education which is full of lies and deception because it is disconnected from the true SOURCE OF KNOWLEDGE -- The Great Creator God of the Universe! Climate Change disasters are the undeniable results and proofs of Man's ungodly education which you believed without really thinking. I don't waste my time on links posted by proud, confident, but ignorant men. Columna Energy Every knowledge and education that is devoid of God's True Knowledge is automatically classified as false and misleading. Paul Carter Sorry Columna Energy, the moderator here. Your statements clearly demonstrate that you are proselytizing, which is not permitted on this forum. Neither is sexist language. So I'm giving you my customary one warning. If there is another post that exhibits either of these attributes, I will ban you from the forum. Columna Energy Paul Carter, it's your decision to continue with your worldly thinking. And I'm also giving this one warning: If you continue with your ungodly reasoning, then God will destroy you with this world. Should you believe your bible or your science book? Mt 4:8 said there is a mountain from w/c all kingdoms of the world can be seen. Err..this implies a flat earth. Rev 6:13 "..And the stars of Heaven fell unto the earth, even as a fig tree casteth her untimely figs, when she is shaken of mighty wind". How big are stars, anyway, to fall to the earth by the thousand like leaves?